Sure, you could settle for a cheap phone charger. But we’re convinced that the nonda ZUS smart car charger is a better deal. We’ll discuss all the reasons why below. To begin, the ZUS charges two smartphones or tablets at the same time. For example, it can refill the batteries of two iPhone 6s in less than 2 hours. In fact, it can recharge just about any mobile device that accepts 5V. Specifically, it outputs 4.8A of current, or 2.4A from each USB port when you charge a regular device. And if you have Qualcomm Quick Charge, the ZUS car charger can recharge your phone 2.4 times as fast. But there’s a lot more to the ZUS than the fact that it tops off your phone. It also has a thoughtful design. For example, the two USB ports are reversible. That means you can plug in your charging cable any which way and it will fit. And the ports also have a soft illumination to help you see them in the dark. Now, have you ever killed a charger by leaving it in your car on a hot day? Fortunately, the ZUS can take the heat. It’s made of German Bayer polycarbonate, a material that meets the US Military High-Temperature Standard. It’s not going to melt during a summer day in Las Vegas. Next, if you want to install the free app, you can pair the ZUS car charger with your phone. Then you can do surprisingly useful things like check your car battery’s health, log miles traveled, and find your parked car. The charger’s LED lights blink to show when it’s ready to pair. Then once it’s connected over Bluetooth, the lights stay steady. When you drive around, the app logs your mileage. And that’s handy if you need to track that for expenses. Once you park the car, the car locator feature remembers where you leave it. But unlike some car finder apps, you don’t need to leave Bluetooth connected. Instead, the ZUS app uses GPS to mark your position. Then later it can tell you how far away you are from your vehicle as long as you’re not parked where you don’t have GPS. Also unlike other car finders, the ZUS app can help you avoid parking tickets. You can set a timer to remind you when time’s up at the meter. It will warn you ten minutes beforehand, just in case. Finally, the ZUS app reveals your battery’s health. Since it tracks it over time, it can advise you if there’s a problem developing before you end up needing a jump start. 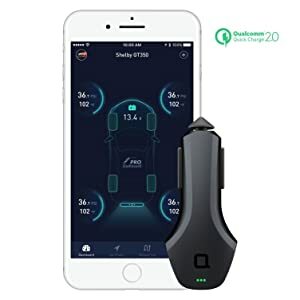 This intriguing feature works along with other products from nonda, like their Smart Tire Safety Monitor. if you would like to see the ZUS in action, this video from nonda provides a detailed overview. We hope you found our review of the nonda ZUS Smart Car Charger helpful. We love it when multipurpose gadgets like this one make life so much easier!